New Alaska Gasline Development Corp. President Keith Meyer directly addressed what he sees as one of the biggest challenges to building a gasline during his first board of directors meeting, and it had nothing to do with the cost of the project. “AGDC has an observable poor relationship with key legislators and legislative committees. I’ve seen it in the press and I’ve felt it in the (legislative) hearings. This has to change,” Meyer said July 14 during a presentation to the board. About two weeks earlier, legislators peppered Meyer with questions for more than four hours during a marathon joint House-Senate Resources Committee hearing in which he, and representatives from BP, ConocoPhillips and ExxonMobil gave their perspectives on the status of the $45 billion-plus Alaska LNG Project. 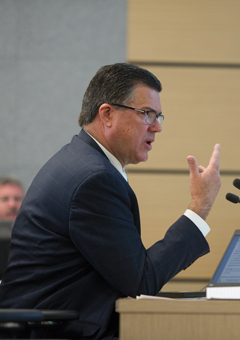 The June 29 hearing in Anchorage was the first time legislators were able to hold a dialogue with Meyer in a public forum, so many of the questions naturally focused on his experience in the natural gas industry and his knowledge and view of the proposed North Slope gas export plan. While the lines of questioning from some legislators exuded understandable skepticism in Meyer’s proposal to reshape the financing structure of the project, others bordered on interrogation backed by clear and immediate opposition to nearly everything he said. The significant underlying problem with that, according to Meyer, is it doesn’t sit well with the “other” key partners in a gasline and it becomes a self-fulfilling prophecy. “When the utility buyers or the (potential) investors see ‘AGDC is not experienced enough to do this project,’ who’s going to want to invest in that project if the government is saying AGDC, which is presumably a government entity, isn’t experienced enough to do this and at the same time AGDC is the only dog willing to pull the sled, willing to step into the lead,” Meyer said. He reiterated at the July 14 board meeting that AGDC and the Alaska LNG Project needs to be more transparent to better its working relationship with other parts of government, something he emphasized at the June 29 Resources hearing. “Anytime you have an absence of information that is probably filled with the worst possible scenario and I think that’s what’s happening here. There’s not enough information out there. People want to fill in the gaps with a fear scenario,” he said. Shortly after taking the reins at AGDC after his hire was approved on June 9, Meyer laid out his concept for way to keeping the Alaska LNG Project through a new way of financing the project that otherwise is delayed for years in a best-case scenario. He suggested the state, through AGDC, seek out third-party investors that would accept a lower but stable rate of return, such as pension or insurance funds or directly the Asian utilities that would be likely buyers of the project’s LNG, compared to the return needs of the producer companies. One of those “fear scenarios” is a rumor that AGDC and Gov. Bill Walker’s administration would seek to finance the project by using the $54 billion Alaska Permanent Fund as collateral if third party financing doesn’t pan out, he said. A confluence of depressed LNG and oil markets has challenged the current and more traditional equity financing structure, with each participant — the state, BP, ConocoPhillips and ExxonMobil — financing equal shares of the project that could cost upwards of $50 billion or more. An oversupplied LNG market has chopped the near-term price of the commodity by more than two-thirds over the last two years, which eats into the potential profits of the Alaska LNG Project. And the project’s 800-mile pipeline from the Slope to Nikiski is a major cost that will always eat into its margins. It’s also a major cost most competing LNG projects worldwide don’t have to deal with. Additionally, current oil prices are less than 50 percent of what they were when the current project structure was approved in 2014, which has hit all the producers’ bottom lines and on some level impaired their financial ability to make the requisite $10 billion-plus investment in the Alaska LNG Project, Meyer said. The producers have all said they hope to monetize the North Slope gas, but don’t see the current project moving to completion on its current schedule in the mid-2020s for a myriad of factors. According to Meyer, they are supportive of the state taking the lead in the project and the third-party investment model, with the producers selling gas into the project or still investing on a smaller scale, is a way to accomplish that. Slowing or stopping the project now means missing a “demand window” that could kill Alaska LNG for another decade or more, he said. Also at the meeting, the board approved opening a marketing office in Houston, but according to the Alaska Dispatch News, board chair Dave Cruz shot down Meyer’s suggestion that his daughter be hired to work for the state agency.